Must-Read Books to Capture your Purpose and Balance for Success. As executive, you have a busy schedule and you may be sacrificing your happiness and balance for your professional commitments. Check out our best books on happiness to capture your purpose and balance in life for success. All the books are exclusively selected for busy executives! There’s a lot that you can do to reach a perfect work-life balance, find time for yourself and be happy at work and in life. 1. How to Be Happy at Work: The Power of Purpose, Hope, and Friendship. Go around and ask a few people what success means to them. How do they define it? How do they know when they’ve achieved it? Many may answer and equate success with happiness. The two concepts seem one in the same, right? Well, if you’re still scratching you head at why, then this book will shed new light on the relationship that exists between happiness and individual, team, and organizational success. How to Be Happy at Work is based on extensive research and the author’s experience with leaders over the decades about balance and happiness. The book is organized around the three elements of purpose, hope, and friendship and how you, as an executive, could create and sustain such elements in the face of pressure and stress so that you can create a positive and healthy climate for your team. 2.The Pie Life: A Guilt-Free Recipe For Success and Satisfaction. Women who work – this is the definitive self-improvement playbook for you. This is one of our top books on balance and happiness! Harvard MBA and bestselling author Samantha Ettus has worked with thousands of women in the last 20 years and is now sharing her secrets on maintaining a thriving professional and personal life, in The Pie Life. She covers all slices of life from career and children to community and hobbies, and how to optimize each no matter where you are in life. Readers love the real-life examples and stories shared from many different and talented women and praise how relatable each story is to their own life. We recommend this book to any executive or entrepreneur looking to balance their lives at both work and home, but especially the women for the honest, unique, and compelling anecdotes directly applicable to your life. Balance your work and life with Samantha Ettus! 3. Designing Your Life: How to Build a Well-Lived, Joyful Life. by Bill Burnett and Dave Evans. Don’t just build a life you can thrive in, design it. Designing Your Life walks you through the process of designing a fulfilling life – regardless of who you are. The same design-centered thinking that solves material problems can be used to design your career and life to create more meaning and to hold the possibility of surprise. The essence of this book is action; if you are stuck, reframe and act again and focus on the journey and the process. You’ll get guidance and encouragement to actually start building upon the life you design with exercises that help you sort through and find the facts that are already in your life. The tone and advice within this book’s words will make sure that this book will become one of your career-finding favorites. 4. Your One Word: The Powerful Secret to Creating a Business and Life That Matter. This guide is for both entrepreneurs and intrapreneurs, as well as managers and really anyone who wants to achieve powerful, meaningful success. More than just a useful tool, Your One Word will teach you how to use personal mottos that capture your purpose in a way that can help you create the business and future of your dreams. There are actionable points that you can try in your life so that you can find your purpose and begin moving forward to achieve it and your goals. The principle behind finding your one word goes beyond defining you and your mission, but it can be applied to defining unifying themes for any project in your work life as well. Careers and life are complicated and confusing, but simplifying things to one word is a technique that you can learn with this book and then use when faced with confusing options and critical decisions. 5. Life on Purpose: How Living for What Matters Most Changes Everything. If you are looking to truly address wellness and not just health, then read this book. This guide, written by a noted researcher and successful entrepreneur, takes a scientific approach as it explores scientific evidence on the quality of life and its connection to purposeful living. Divided into four sections, you’ll read about the framework of purpose, how purpose relates to energy, activity and more, and lastly an examination of purpose and resilience. Vin Strecher provides a six-step model for finding one’s purpose with a strategy to improve energy and willpower while developing a plan for your well-being and long-term happiness. If you are seeking lasting improvement, then Life on Purpose is essential for your entire life. Read this book and find balance and happiness in life. 6. 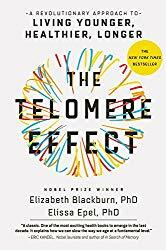 The Telomere Effect: A Revolutionary Approach to Living Younger, Healthier, Longer. by Dr. Elizabeth Blackburn and Dr. Elissa Epel. There are many New York Times bestselling books in our Books section for executives, and this one is no exception, but what’s unique is that this bestseller was coauthored by the Nobel Prize winner who discovered our telomeres’ role in the aging process and by the health psychologist who originally researched how our habits and lifestyle slow disease, improve life, and protect our telomeres. The Telomere Effect shows how our habits and lifestyle, such as diet, exercise and sleep, can affect our telomeres. This book also continues to explain how negative habits and lifestyles, such as negative thoughts, chronic stress, strained relationships, and even where you live can eat away at our telomeres. If you’re an executive that looks at problems from the cellular level, then this book is for you! Learn how to age well by making simple changes to keep your cells and chromosomes healthy so that you can live better life. Want to do more in less time at work? Want to regain focus and increase your energy in the office? Check out our top books on focus and productivity. Become an expert in productivity now!